In the not too distant future, at a Japanese high school, teenage android Shinobu purchases the trending drug Spacix. It’s news to the principal that androids can take drugs, downloading a program that simulates the drugs’s effects, including the side effects, which can be devastating for Shinobu and other adolescent androids, as the real life drug has been for human teens. 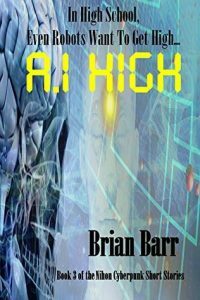 Barr creates a credible world of humans and androids co-existing, with all the messiness of human emotions and scientists with god complexes. Third in the Nihon cyberpunk series, this tale continues with the concept of programming robots with emotions, going a step further in the creation of realistic humanoids with upgrades to mimic growth to fulfill the dream of parenthood for infertile couples. Characters are complex and situations challenging as a teen does the stupid things that teens do, only in a—brilliantly created—world with constantly shifting lines determining what is digital and what is human. Keep an eye out on laelbraday.com for a review of the next story in the Nihon cyberpunk series.